Boolean filters can be applied for precise grouping, and there is an automated mask creation feature for subsequent Raman analysis. ParticleScout makes full use of Raman imaging's advantages in fast, label-free and nondestructive chemical characterisation while accelerating the workflow for the researcher. In seamless combination with WITec's TrueMatch database software, the user can build a catalogue of particles based on their constituent molecular components linked to physical attributes, such as size or aspect ratio, and produce a report that quantifies specific particles in a sample. View the demo video here. • Focus Stacking for sharp and In addition to environmental science, ParticleScout is also of benefit to scientists defined particle imaging working in pharmaceuticals, cosmetics, food technology, geosciences and manufacturing. For more details, download the brochure or contact us. 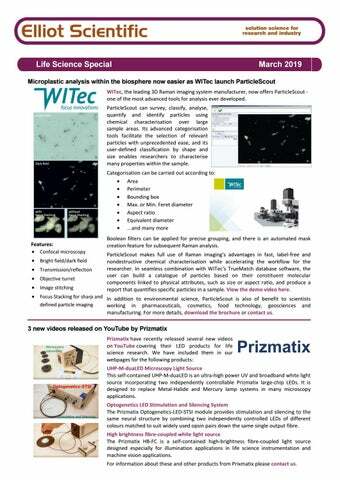 3 new videos released on YouTube by Prizmatix Prizmatix have recently released several new videos on YouTube covering their LED products for life science research. We have included them in our webpages for the following products: UHP-M-duaLED Microscopy Light Source This self-contained UHP-M-duaLED is an ultra-high power UV and broadband white light source incorporating two independently controllable Prizmatix large-chip LEDs. It is designed to replace Metal-Halide and Mercury lamp systems in many microscopy applications. Optogenetics LED Stimulation and Silencing System The Prizmatix Optogenetics-LED-STSI module provides stimulation and silencing to the same neural structure by combining two independently controlled LEDs of different colours matched to suit widely used opsin pairs down the same single output fibre. High brightness fibre-coupled white light source The Prizmatix HB-FC is a self-contained high-brightness fibre-coupled light source designed especially for illumination applications in life science instrumentation and machine vision applications. For information about these and other products from Prixmatix please contact us. Motorised Siskiyou micromanipulators for bioscience now available in the UK and Eire For interaction with a microscope sample the micromanipulator has been a staple of the biologist’s toolkit from the beginning of the 20th century. Used for holding, injecting or cutting, the precision of the micromanipulator's motion has always been paramount. So many leading researchers of the time, including Dr Robert Chambers and Sir Andrew Huxley, worked on improving the mechanics of these systems over the years. These early devices relied on adjustment of the individual axes by hand, but by the 1950’s De Fonbrune had developed a pneumatic micromanipulator that allowed all three axes to be operated via a joystick-like controller. Depending on the application, researchers might need different movement ranges and resolutions, speeds and accuracy; so ranges of micromanipulators are available of different constructions to suit. Siskiyou Corporation offer mechanical, hydraulic, and electronically-controlled motor adjusted systems. The latter micromanipulators are fully CE-certified and are now on sale to UK and Irish researchers. Models available include: MX1641 Series – ideal for entry-level research and training This crossed roller micromanipulator uses spring-loaded lead screws on three axes to ensure drift-free operation, and a motorised probe axis delivering up to 0.1 µm movement resolution. MX7600 Series – ideal for patch recording experiments A fully motorised crossed roller bearing micromanipulator offering exceptionally smooth linear travel via its precision preloaded lead screws to ensure drift-free operation and up to 0.1 µm movement resolution. MX7800 Series – ideal for multipatch-recording experiments This variant of MX7600 series uses a new folded Y-axis stage that narrows the footprint of the manipulator by half. This design enables the mounting of as many as six micromanipulators in a semi-circle from side to side around the front of a microscope. For more information, please visit our Siskiyou Life Science Products, or contact us. PS. Micromanipulators can also be useful for holding tools and probes while examining microelectronics under a microscope! Near-instant Digital Holographic Microscopy technique ensures cell measurements are fruitful Lyncée Tec has done much in developing quantitative phase imaging for the life sciences. Their DHM® (Digital Holographic Microscope) systems enable label-free noninvasive continuous measurement of cells. Quantitative phase measurements can be done in milliseconds, or over many days, to provide information about cell morphology and intracellular content, cell proliferation and viability, trans-membrane ionic currents and water transport, as well as many others. Systems are available stand-alone - the DHM®-R, or as a DHM®-Camera add-on for an existing microscope (Pictured left). A large range of accessories enable you to customise your DHM® for your sample's characterisation needs. These include a broad choice of objectives, such as High NA and oil immersion; motorised XYZ stages; high speed cameras; a simultaneous fluorescence module and more. 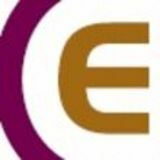 Lyncée Tec also offer software modules for the experimental data. Covering single site and multiwall (HCS) cell and population analysis, end-point measurement, timelapse, and dose-response curves; automatic processing and quantification of your experiment is now a breeze. For more details on these and the rest of the Lyncée Tec range, please contact us.